Emphasizing that President Trump would bear consequences “far beyond his words”, he said the high-handedness and arbitrariness of one big Power had jeopardized the purposes and principles of the United Nations Charter. Indeed, the most rampant violation of international justice was now being seen on the Korean Peninsula. The unprecedented imposition of harsh sanctions on a victim —simply because it had stood up to the offender — had been openly committed in the name of the United Nations. The United States had been the first country to produce nuclear weapons, and the only one to use them, he said, recalling that it had first introduced such weapons to the Korean Peninsula after the Korean War. It was for those reasons that the Democratic People’s Republic of Korea must possess nuclear weapons. “In the United Nations, unjustifiable resolutions which illegalize justice as injustice are randomly adopted,” he said, emphasizing that justice could only be achieved through the strength of anti-imperialist countries. “The possession of nuclear deterrence by the [Democratic People’s Republic of Korea] is a righteous self-defensive measure,” he said, pointing out that it had recently conducted a successful test of a hydrogen bomb mounted on an intercontinental ballistic missile, entering a new phase in its nuclear programme. The goal was to establish a balance of power with the United States. That country and its followers would now have to “think twice” before launching a military provocation against Pyongyang. “We do not need anyone’s recognition of our status as a nuclear-weapons State,” he said, adding that the United Nations failure to achieve genuine international justice was related to the Security Council’s old and undemocratic practices. The fact that Council reform had come before the Assembly year after year with no progress demonstrated how deeply its five permanent members held their anachronistic vested interests. 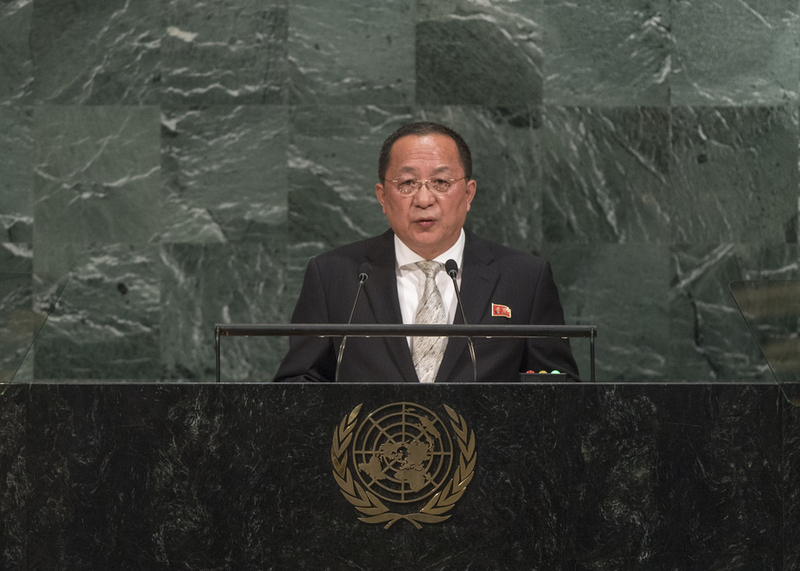 He said the Council had fabricated illegal resolutions based on double-standards to prohibit the Democratic People’s Republic of Korea from launching satellites for peaceful uses, or exercising its right to conduct nuclear tests, which belonged to every State, since international law on that matter had not yet entered into force. Emphasizing his country’s right to self-defence under the United Nations Charter, he said Article 10 of the Nuclear Non-Proliferation Treaty stated that the supreme interests of States stood above nuclear non-proliferation. “After all, the United States itself impeded the international efforts for non-proliferation by not giving up the nuclear threat against the [Democratic People’s Republic of Korea],” he said. Claims that Pyongyang’s possession of a hydrogen bomb and ICBMs constituted a global threat were lies tantamount to those made by the United States in 2003 about the existence of weapons of mass destruction in Iraq.